[Figure 1] demonstrates the survival rate from HIV to AIDS stage and from AIDS stage to the death for both sexes using Kaplan-Meier method. As shown in the figure, survival rate for woman was higher than that for men. Figure 1: Survival time of HIV/AID patients in Iran between 1987 to 2016 by gender. The life table for survival rate from HIV to AIDS stage, and from AIDS stage to the death and from HIV-infection to the death was presented in [Table 1]. The total duration of follow-up for the included patients was 100 411 person-years with a median follow- up of (3.4±3.8) years. The one-year, three-year, five-year and ten-year progression rate from HIV to AIDS was 85% (1-3 466/23 699), 73% [(1-867/11 351)x79%], 61% [(1-674/7 440)x67%], 32% [(1-217/1 728)x 36%], respectively. Table 1: The survival time of progression from HIV-positive to AIDS and from AIDS to death in Iran from 1987 to 2016 by using life table. 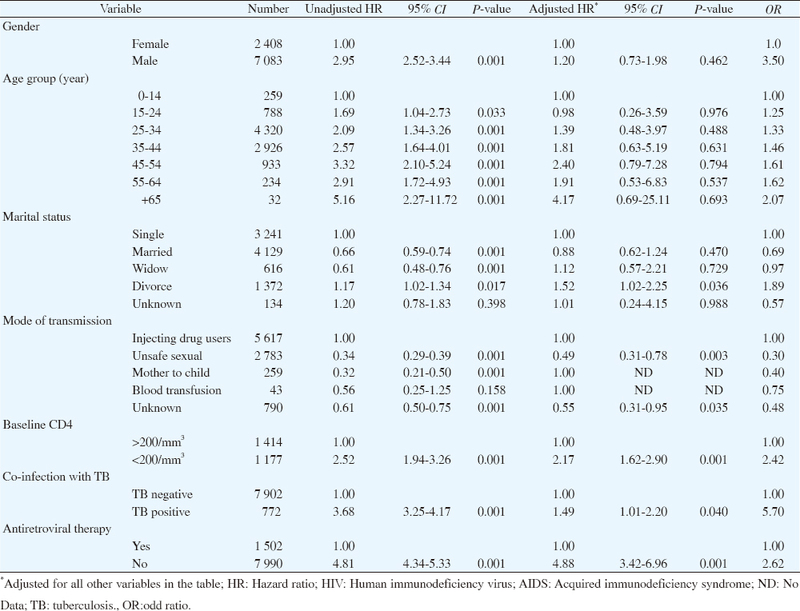 The hazard ratio (HR) of the association between the prognostic factors and progression from HIV to AIDS and AIDS to the death is presented in [Table 2] and [Table 3] respectively. 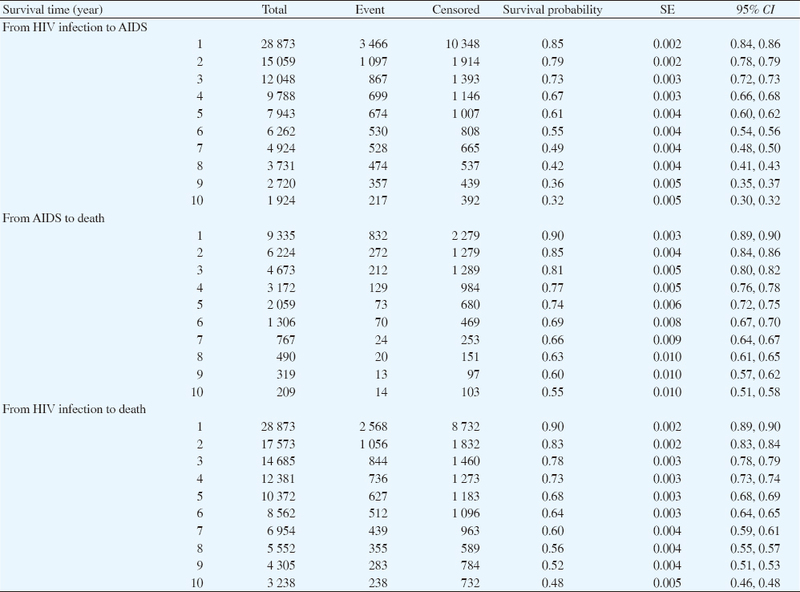 As shown in [Table 2], there was a significant difference in the risk of progression to AIDS between age groups (P=0.001). The risk of progression to AIDS in the married patients was 21.0% higher than single patients (P<0.001). Moreover, compared with injecting drug users, the risk of progression in patients with the unsafe sexual contact was 39.0% higher (P=0.001). 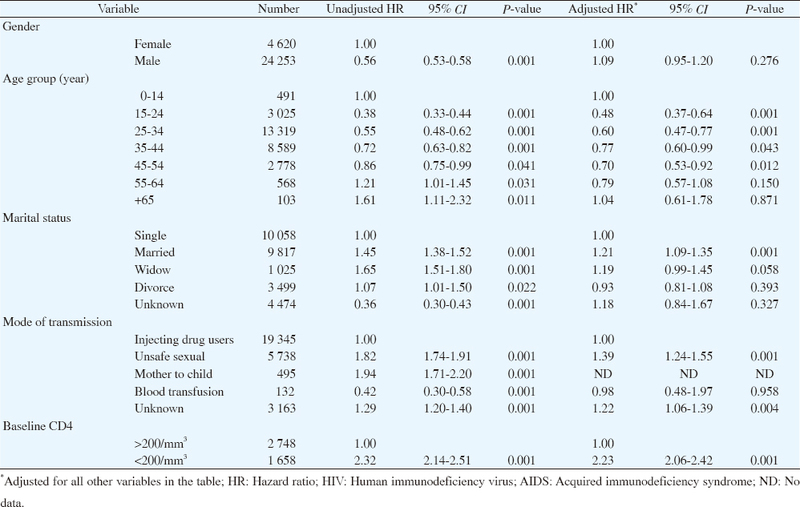 Individuals with CD4 less than 200/mm3 were 2.32 (95% CI: 2.14, 2.51) times more likely to progress to AIDS than individuals with CD4 more than 200/mm3 (P=0.001). Table 2: Effect of prognostic factors on survival time of progression from HIV-infection to AIDS stage using Cox regression model in Iran from 1987-2016. Table 3: Effect of prognostic factors on survival time of progression from AIDS stage to death using Cox regression model in Iran from 1987-2016. Schonfeld A, Feldt T, Tufa TB, Orth HM, Fuchs A, Mesfun MG, et al. Prevalence and impact of sexually transmitted infections in pregnant women in central Ethiopia. Int J STD AIDS 2018; 29 (3): 251-258. Centers for Disease Control and Prevention. HIV/AIDS. [Online] Available from: https://www.cdc.gov/hiv/basics/whatishiv.html [Accessed on 4th August 2017]. World Health Organization. HIV/AIDS. [Online] Available from: http:// www.who.int/mediacentre/factsheets/fs360/en/ [Accessed on 4th Agust 2017]. United Nations on AIDS. Latest global and regional statistics on the status of the AIDS epidemic. [Online] Available from: http://www.unaids.org/en/resources/documents/2017/UNAIDS_FactSheet [Accessed on 4th Agust 2017]. Centers for Disease Control and Prevention. Guidelines for the use of antiretroviral agents in adults and adolescents living with HIV. 1st ed. Washington: CDC; 2017. Nsanzimana S, Remera E, Kanters S, Chan K, Forrest JI, Ford N, et al. Life expectancy among HIV-positive patients in Rwanda: a retrospective observational cohort study. Lancet Global Health 2015; 3 (3): e169-e77. World Health Organization. Guidelines for managing advanced HIV disease and rapid initiation of antiretroviral therapy. 1st ed. Geneva: WHO; 2017. Liu ZQ, Zhou N, Bai JY, Guo Y, Yu MH. Analysis of survival and influencing factors of HIV/AIDS patients in Tianjin, 2004-2014. Zhonghua Liu Xing Bing Xue Za Zhi 2017; 38 (3): 369-373. Poorolajal J, Hooshmand E, Mahjub H, Esmailnasab N, Jenabi E. Survival rate of AIDS disease and mortality in HIV-infected patients: A meta-analysis. Public Health 2016; 139 (1): 3-12. Poorolajal J, Molaeipoor L, Mohraz M, Mahjub H, Ardekani MT, Mirzapour P, et al. Predictors of progression to AIDS and mortality post- HIV infection: A long-term retrospective cohort study. AIDS Care. 2015; 27 (10): 1205-1212. Mirzaei M, Poorolajal J, Khazaei S, Saatchi M. Survival rate of AIDS disease and mortality in HIV-infected patients in Hamadan, Iran: A registry-based retrospective cohort study (1997-2011). Int J STD AIDS 2013; 24 (11): 859-866. World Health Organization. TB and HIV. [Online] Available from: http:// www.who.int/tb/areas-of-work/tb-hiv/en/ [Accessed on 4th Agust 2017]. Whalen CC, Nsubuga P, Okwera A, Johnson JL, Hom DL, Michael NL, et al. Impact of pulmonary tuberculosis on survival of HIV-infected adults: a prospective epidemiologic study in Uganda. AIDS (London, England) 2000; 14 (9):1219. Whalen C, Okwera A, Johnson J, Vjecha M, Hom D, Wallis R, et al. Predictors of survival in human immunodeficiency virus-infected patients with pulmonary tuberculosis. The Makerere University-Case Western Reserve University Research Collaboration. Am J Respir Crit Care Med. 1996; 153 (6 Pt 1): 1977-1981. Spagnuolo V, Galli L, Salpietro S, Gianotti N, Guffanti M, Cossarini F, et al. Ten year survival among HIV1infected subjects with AIDS or non-AIDS defining malignancies. Int J Cancer 2012; 130 (12): 2990-2996. Lopez-Gatell H, Cole SR, Margolick JB, Witt MD, Martinson J, Phair JP, et al. Effect of tuberculosis on the survival of HIV-infected men in a country with low TB incidence. AIDS (London, England) 2008; 22 (14): 1869. Reynolds SJ, Makumbi F, Nakigozi G, Kagaayi J, Gray RH, Wawer M, et al. HIV-1 transmission among HIV-1 discordant couples before and after the introduction of antiretroviral therapy. AIDS (London, England) 2011; 25 (4): 473. Teeraananchai S, Kerr SJ, Amin J, Ruxrungtham K, Law MG. Life expectancy of HIV-positive people after starting combination antiretroviral therapy: a meta-analysis. HIV Med 2017; 18 (4): 256-266. Seyoum D, Degryse JM, Kifle YG, Taye A, Tadesse M, Birlie B, et al. Risk factors for mortality among adult HIV/AIDS patients following antiretroviral therapy in Southwestern Ethiopia: An assessment through survival models. Int J Environ Res Public Health 2017; 14 (3): 2-12. Djalalinia S, Moghaddam SS, Peykari N, Kasaeian A, Sheidaei A, Mansouri A, et al. Mortality attributable to excess body mass index in Iran: Implementation of the comparative risk assessment methodology. Int J Prev Med 2015; 6(1): 107.